Are you at Whitehawk Hill, Craven Vale or Racehill Allotment Sites? 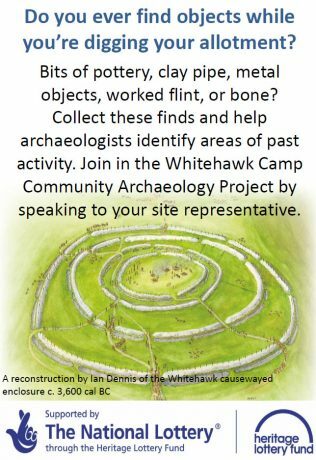 A rather exciting project is taking place to look at the archaeology of Whitehawk Hill, there may be important finds on your plots! If you are willing to help liaise with Dr Hilary Orange who is organising the project then please email us with your details and we will pass them on to her. 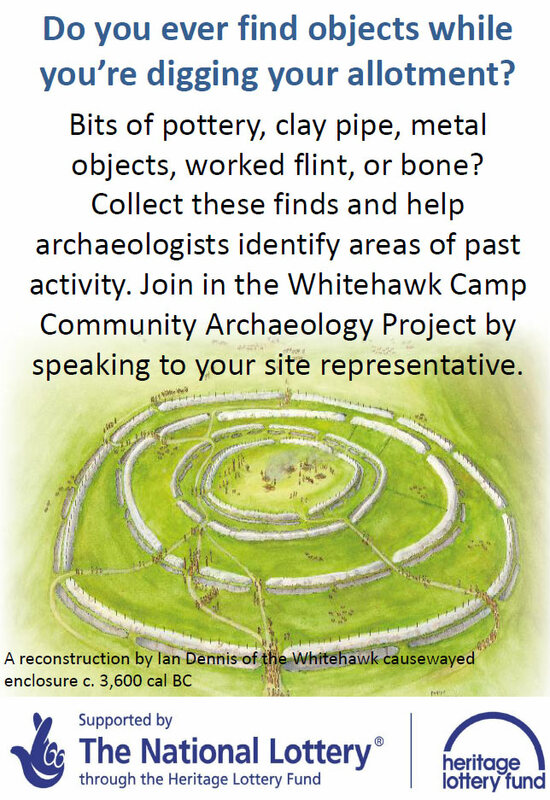 We (the Whitehawk Camp Community Project partnership) would like to invite all allotment gardeners at Race Hill, Whitehawk Hill and Craven Vale Allotment Associations to join in a community archaeology project by collecting finds from their allotment plots. These allotments are situated in close proximity to Whitehawk Camp, a Neolithic (Stone Age) monument known as a causewayed camp. The Camp is one of the UK’s earliest archaeological sites (around 500 years older than Stonehenge). It was excavated by archaeologists in the 1920-30s and they uncovered a large collection of human bone, stone tools, pottery and large numbers of animal bones. The animal bones suggest that communal feasts used to take place on the site. A programme of community archaeology is planned around the theme of ‘Food.’ We are hoping that finds from the allotment will help us to identify areas of past activity on Whitehawk Hill. Each bag needs to be marked clearly with the allotment name and plot no. Each person taking part registers with the project as a volunteer.